It’s been quiet on the blog – more so than usual – over the last few weeks because it’s been a bit chaotic here. You see, Izzy dislocated a toe on an evening walk and her rehab has been my priority. The medical description of her injury was a ‘medial dislocation of the 5th digit.’ That’s the outside toe for those laypeople out there and it meant that the toe decided to go towards the centre of her body and at one point was completely tucked under the pads of the toes on the foot. Ouch! The most immediate concern was pain relief and I am grateful that we have an After Hours vet in our city. Not all locations have this and you have to wait until morning to see a professional. We were back out at our vet in the morning for an exam and they agreed with me to treat it conservatively which meant putting the toe back into place under anesthesia, restricted exercise (going to the toilet only) and NSAIDs for pain relief. I can’t emphasize enough the importance of enrichment activities for a dog that must rest. Boredom can quickly set in and enrichment keeps their minds active so they are less likely to want to exercise and, in Izzy’s case, do zoomies in the house. She taught a massage workshop with me on 27th October just 2 days after having her toe re-aligned; she simply had to sit out the gait analysis part of the agenda. Otherwise, she was my perfect demo dog as usual and the change of scene was good for her. She came home happy and tired. And later in the week, my hairdresser allowed her to come with me so she could have another change of scene and enrichment. After my hair was done, Izzy had her short toilet walk in a new neighborhood with new and different smells – also enrichment. I’ve been taking her for short toilet breaks to other parks, too. And rides in the car are also stimulating activities for her. In between, I’m lucky that I had a friend who looked after her for two days while I was working and during this time she also had the company of another greyhound. It really helps to have friends who understand and can help out when you dog is injured. I’ve been lasering Izzy’s toe daily to help with blood flow and tissue healing and she is back to walking, although I am increasing the distance of her walks slowly to ensure we don’t over do it. Also, after a period of rest, the physical condition of a dog declines. So it’s wise to manage the re-introduction of exercise to avoid other strains and injuries. Izzy has arthritis in her carpus (wrist) and toes, and so this injury is probably also a sign of the vulnerabilities that we will need to manage as she gets older. The good news is that she is on the mend and we haven’t had any set back so far. A change of scene, play, and social time with other dogs are all important to the emotional health of our dogs. Izzy, for example, has a boyfriend who lives on the other side of the city. His name is Bergie and they have a special relationship. I can’t even remember when it started; they just met at greyhound walks and bonded to each other. So, it’s important to his owners and to me that we make the time for them to see each other. This week, they finally managed to have a play date after being severely rained out of one date and then missing another chance to see each other when, again, the rain and cold interfered with the monthly farmers market display for Greyhounds as Pets. On this date, Bergie decided to impress Izzy with his hole digging skills…she took a front row seat! In my massage practice, I see quite a few special needs dogs. These can be senior dogs who are slowing down for a variety of reasons, dogs who have been injured, and dogs who are terminally ill. Some also have behavioral difficulties which exacerbate any physical limitations they may have. One of the things I address with my clients is enrichment. The dog may be physically limited in its abilities but is not impaired cognitively. Like older people who have entered rest homes/nursing homes, or who are being cared for at home, these dogs need stimulation and variety. Visitors, including other dogs, is just one example of an enrichment activity. Another issue for owners in this situation is introducing variety by getting their dog out of the house. If a dog enjoys car rides, for example, they may be happy just to take a drive to a new location with the windows down to experience new scenery and smells. 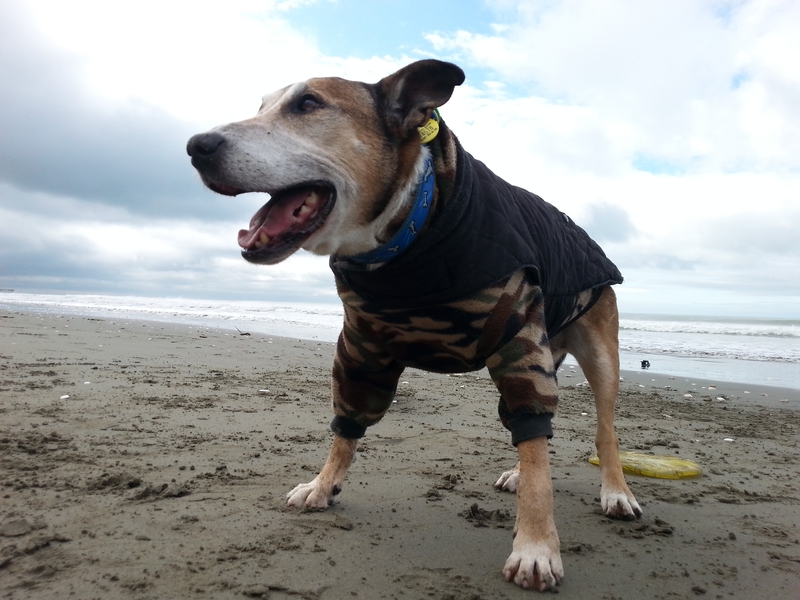 Kenny, a 13+ year old Bull Terrier/Blue Heeler cross, was taken to the beach recently. He needed to be carried from the car to the beach but his smile says it all! I know some owners who take their dogs for a take-out meal so they can sit in the car and enjoy it together – with snacks included. Once owners have tried enrichment activities with their dog, they have universally reported to me an improvement in the dog’s disposition and general engagement.